Over two years ago now, Valve attempted to give modders a platform to earn a profit on their creations. This radical move proved to be very divisive and was promptly shut down. I was more on the fence, but one thing I find to be a certainty. Valve’s execution when it came to the introduction and method of selling the mods themselves was flawed. With no prior announcement, Valve launched their paid mods system without any consumer input. They allowed the “dump truck of feedback” to come only after they had already launched the service. If a product or service has the potential to rock the boat of an entire community, you may want to get their input on it before you launch and risk having it be demonized forever if it fails. Several months ago, Valve expressed that they were not about to give up on this idea. As I was thinking about it the other day, my brain spontaneously delivered to me 3 possible solutions on how mod creator can become a profession. Gabe Newell makes clear Valve&apos;s intention to bring back paid mods. Valve doesn’t necessarily have to be involved, and with them out of the way, developers and/or publishers can bypass them as a middleman. In a way this has already occurred when a group of modders proved themselves by creating the long war mod for 2012 Firaxis Games’ XCOM: Enemy Unknown. They went on to form their own development company, Long War Studios, later renamed to Pavonis Interactive. Developers at Firaxis were so impressed that they formed a partnership with Pavonis and had them develop several mods for XCOM 2. Imagine if a company like Pavonis could have been established or approved and partnered with the developer for continued support of their game with new and unique content that can be officially sold. The profits of which go towards continued support of the team. Continued support for a game that you know is going to have a long lifespan can have a very positive effect on the company’s image. Battlefield 4 was released with major issues, but with continued patch support, and establishment of the Community Test Environment, the launch woes are a distant memory. It’s a well known fact that a developer can only invest so much time supporting their game before they have to move on to their next project. Bethesda is the most obvious company that can benefit from having prolonged support for their games. Every Bethesda game on the mod nexus features an “unofficial patch”. At a certain point the developers themselves can’t continue fixing issues, even if they wanted to. But besides technical issues, wouldn’t Bethesda want to be able to take some credit for mods like sim settlements? “Well how is this different from DLC? Developers outsource DLC creation all the time.” You might be wondering. Like patch support, DLC production also come to an end. Fallout 4 players were somewhat disappointed by the amount of settlement DLCs. The modding team will also need to have a sufficient level of autonomy, unconstrained by things like universe lore. I suppose you could call it DLC developer with more creative freedom and without any established date of when new content will stop being released. The Developers win with the increased lifetime sales that come from a game receiving new content and from having current players be more likely to buy their next game. The Mod developers win by being able to make a living off of creating their mods. The gamers win from the continued support and new content. Throughout Valve’s paid mods debacle there was a recurring argument. There should simply be a “tip jar” functionality installed into the steam workshop. A sensible enough idea that steam should install for the time being. It would also be a great source of information on how much can be earned from only a pay if you want method. If enough can be earned to sustain the lives of an individual or an entire group, then Valve’s paid mod system would be entirely unnecessary. However, receiving only 25% of the tips would be unconscionable. We live in a world where content creators, online news organizations, and streamers of all kinds can sustain themselves largely, or entirely, off a mass of small donations through websites like patreon. It is entirely possible for a team of modders to use such a platform in order to completely dedicate their time to the creation of mods for a particular or even multiple games. A quick google search reveals that this is not a unique idea. But only individuals, and not entire teams seem to be using patreon. Furthermore they aren’t raising enough money for it to qualify as a viable full time profession. Imagine if the Long War team was never approached by Firaxis Games and after XCOM 2 released, announced that they’re working on Long War 2 in their free time. Assuming they all have day jobs. But if the fans have the desire to see Long War 2 reach its full potential and beyond with even more mods, then support us on patreon. Give them the freedom to work on high quality mods, full time. People would have eaten that up. This is a method that Valve can get in on. One that they are most likely considering for paid mods 2.0. Much like the app stores of many companies, developers would need to have their mods approved before they are able to be sold. The process would have to check for things like, all unique or approved asset use, copyright infringement, pricing suggestion, and quality in general. Such an endeavour will require quite a hefty amount of manpower and as I’m sure you’re aware, Valve can barely support someone out of a wet paper bag. “Sir? Have you tried sniffing your way out of the bag?... Yes? Let me get back to you in about 5 months.” I jest of course. I’ve only had to deal with them once and it was an issue that over 10000 people experienced. At least I got a free game out of it. But the point is that if Valve goes down this road, they’re gonna need some people who know what they’re doing. The idea of paid mods itself isn’t an inherently bad idea. I don’t think that it will completely make free mods disappear. It’s all in the way it’s executed. I see a lot of people say that some mods are better than what the developer themselves create. Imagine what these people can come up with if they can make a career out of mod creation. 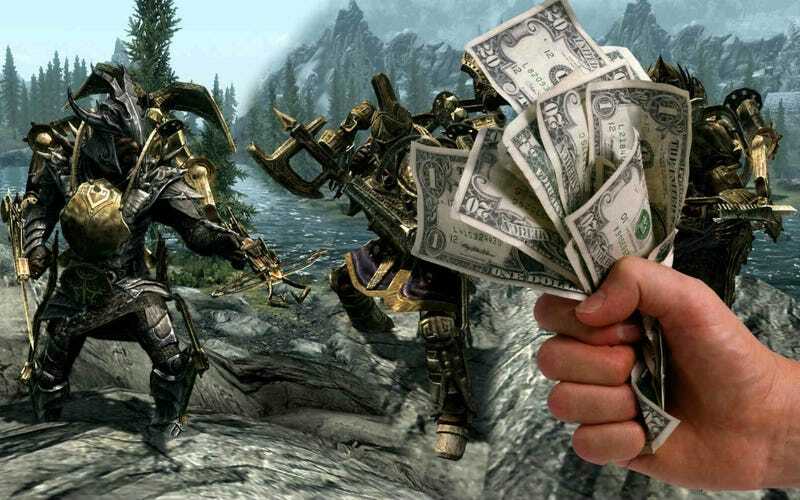 At the very least, ideas on how paid mods could work is worth discussing. So let’s do that in the comments section. Papito Qinn is the winner of the 2016 SpookTAYcular Scary Story Contest, and a twitter incompetent. I mean, do I tell people that I’m eating a sandwich or something?